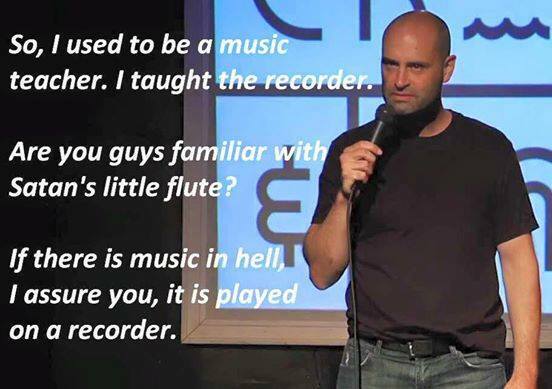 As it often happens, someone in a social network just shared one of those sometimes funny and accurate (not this time) memes, in this case about the way many people (unfortunately) see the recorder today. This view is based on the main (most often the only) way they get to know and experience it: as a cheap, plastic toy randomly played by children in a crowded classroom. This is obviously not fair. What the guy in the linked image above and many other people must have surely experienced is today's widespread plastic toy version of the instrument: naturally, it sounds bad to me, too. But I’d say more: take whatever musical instrument and make a factory mass-produced, cheap, plastic version of it. Yes, make a cheap, plastic guitar, violin or saxophone: how great would they sound? Could we even compare them with the results that a handmade instrument by an experienced maker’s meticulous craftsmanship could achieve? Well, this is how good recorders are made. Sometimes as family businesses that have lasted over several decades, thus sharing and inheriting their insights, experience, secrets and findings over the years: Rauch von Schrattenbach, Schnitzer, Bassano, Hotteterre, Stanesby, Bressan and Denner are just a few of such families that consistently produced all sort of state of the art wind instruments, including recorders. When imagining a recorder, think of them instead of the mass produced Hohners and the like. It would be hard to put it in a shorter, more brilliant and effective way.